Soviet forces entered into the former Kwantung Leased Territory shortly after the Japanese surrender of 18th August 1945 and postal services were suspended for six months. The Russians quickly established links to the local communist areas and gradually this increased to all communist held areas in China. 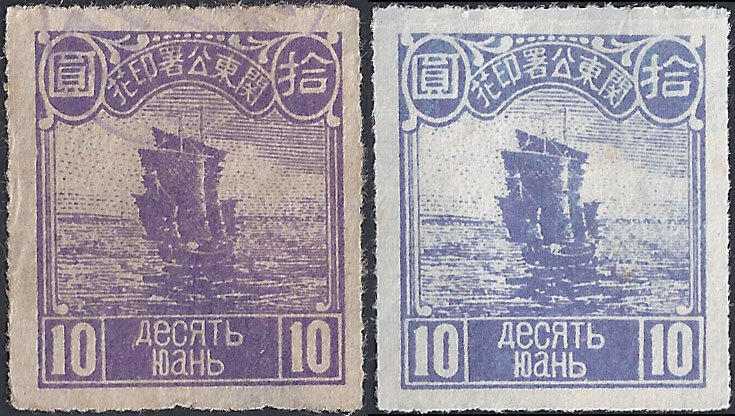 In the former Kwantung Leased Territory a joint Russian/Chinese administration evolved and issued a small number of tax stamps. 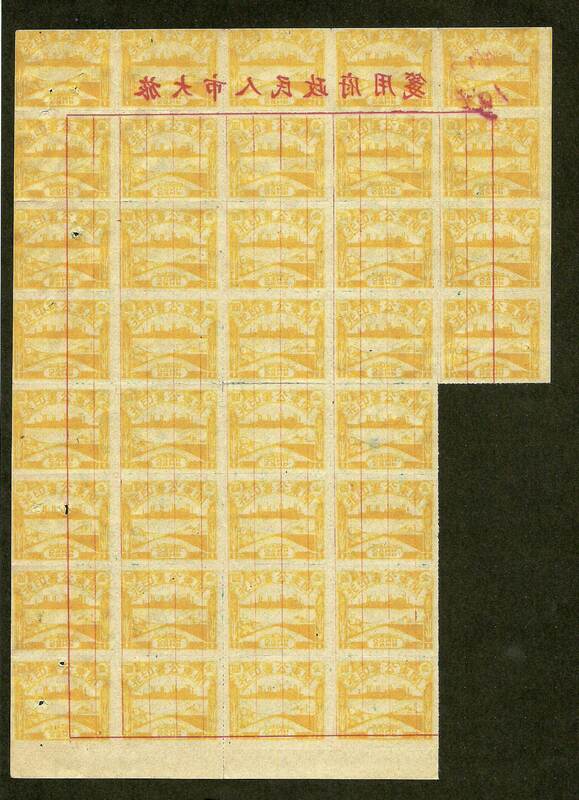 The stamps shown below came into use for a short period immediately after the war. 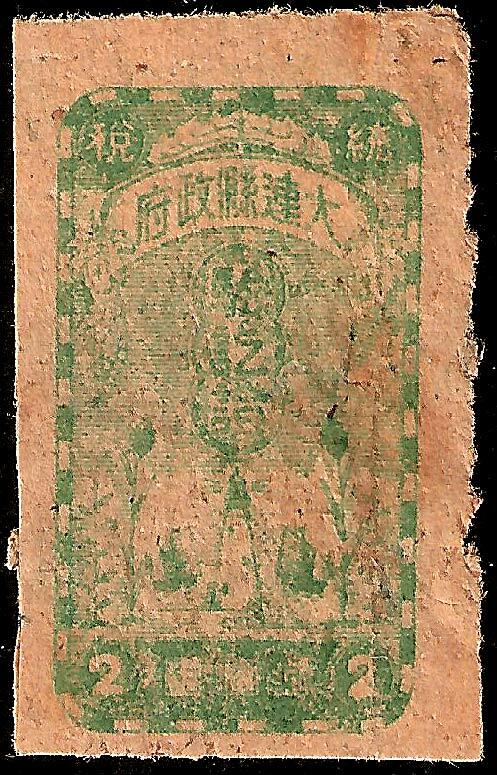 This is a 1 Yuan revenue stamp thought to have been in use between 1945 and 1949. Colours vary from pale yellow to orange yellow. 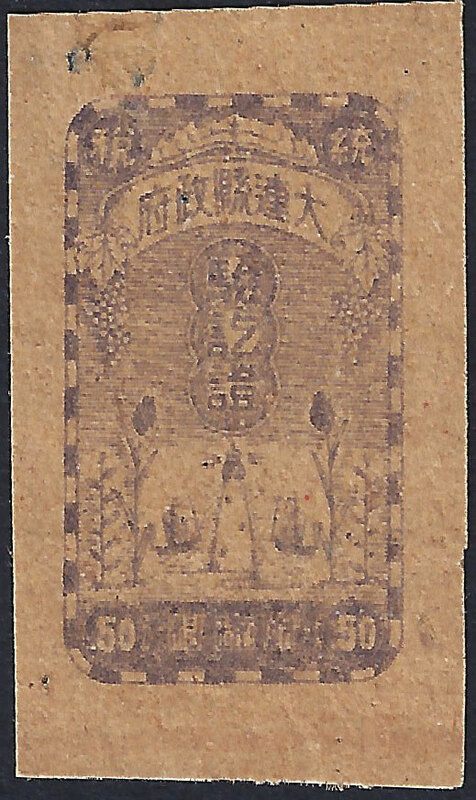 The Chinese characters read 關東公署印花 Kwantung Authorities Tax Stamp (Guandong Gongshu Yinhua). The above stamp is fairly common, those shown below are very hard to find indeed. Size 32mm x 26mm, Rouletted, No Gum. These stamps were used as notepaper by the Kwantung Authority in the early 1950's. Click here to see an example. This is a 10 Yuan revenue stamp possibly part of the same set as the above and also in use between 1945 and 1949. 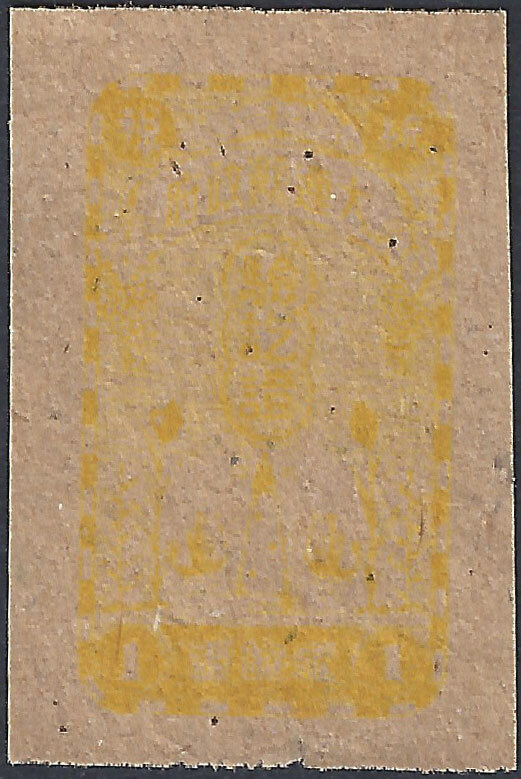 The Chinese characters read 關東公署印花 Kwantung Authorities Tax Stamp (Guandong Gongshu Yinhua). The Russian text reads десять юань 10 Yuan. 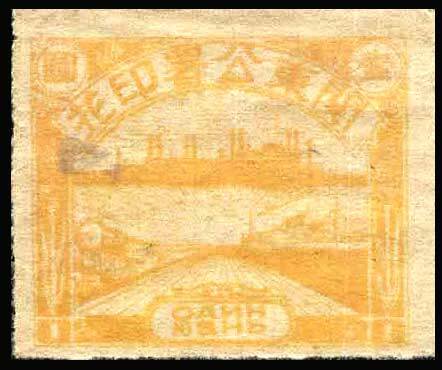 There seem to be two distinctive colours for this stamp, lilac and grey/blue, other variations may exist. (Both stamps were scanned together). Size 26.5mm x 30.5mm, Rouletted, No Gum. 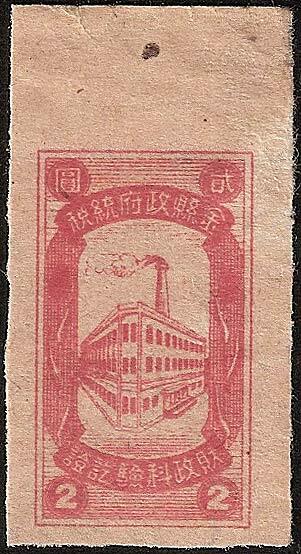 This set of stamps reads 大连县政府 - Dairen County Government, a term used around 1946. The three characters above the lighthouse read 验讫证 meaning 'Certified Certificate'. Size 15.5mm x 28mm, Imperf, No Gum. This red local 2 Yuan revenue with a factory design reads, top 金县政府统税 - Jin County Government Excise (Jin County is on the Laioning Peninsula) below 财政科验讫证 Finance Branch Certified Certificate. Frankly I am not sure where this fits in or when it dates to - if you have any information please let me know. Size 18mm x 32mm, Imperf, No gum.